Huawei Rotating Chairman Guo Ping at a press conference today. TECH FIRM HUAWEI has launched legal proceedings against the US government in a bit to overturn a law that bars federal agencies from buying its products. It comes as the Asian company aims to counter warnings from US authorities that its products could aid Chinese intelligence services. Huawei said that its case filed in a US district court in Plano, Texas, will challenge a 2019 defence bill that prevents government agencies from buying its equipment, services or working with third parties that are Huawei customers. The US is said to have long considered the telecoms company a threat, with fears centering on its relatively new status as a global power in this field. It has warned that Huawei’s equipment could be manipulated by China’s government to spy on other countries and disrupt critical communications, and is urging nations to shun the company. A law recently enacted by Beijing that obliges Chinese companies to aid the government on national security has added to the concerns about Huawei. However, this move towards legal action from the telecoms company is being seen as a signal that it will use all means – including the courts – to prevent attempts to exclude it from a race to the 5G market. If this law is set aside, as it should be, Huawei can bring more advanced technologies to the United States and help it build the best 5G networks. Guo said the company was seeking unspecified damages. “The US government is sparing no effort to smear the company,” he said at a news conference at the tech giant’s corporate headquarters in the southern Chinese city of Shenzhen. Guo even countered that the US government “has hacked our servers and stolen our emails and source code”, without providing details. The lawsuit says the legislation is an “unconstitutional exercise of executive and/or judicial power” and deprived Huawei of a “fair hearing” to rebut the allegations against it. 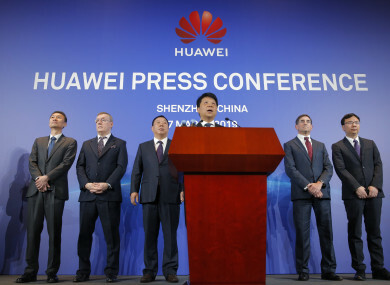 Huawei has been engaged in a PR drive in recent months in a bid to challenge allegations it was being used to spy on other countries, with its founder Ren Zhengfei denying claims against the company in a number of foreign interviews. This new clash in US court comes against the backdrop of ongoing US-China trade talks and the December arrest of Huawei’s Chief Financial Officer Meng Wanzhou, Ren’s daughter. A Canadian court yesterday set a 8 May date for the start of Meng’s hearing into a US extradition request over charges that she and Huawei circumvented US sanctions against Iran. Two affiliates also have been charged with stealing trade secrets from telecommunications group T-Mobile. Two Canadians were subsequently detained in China in suspected retaliation over Meng’s arrest. Huawei officials said the company, which operates in 170 countries, had never been party to any major security breaches and never received any request from the Chinese government to install security “backdoors” in its equipment or to gather intelligence. Email “Huawei takes US government to court over law that bars use of its products”. Feedback on “Huawei takes US government to court over law that bars use of its products”.